IG Group's recent financial disclosure has charted an optimistic course for H2 2017 and beyond. 2017 has been a mixed bag for many publicly listed retail brokerages in the industry. However, IG Group (LON:IGG) seems to be departing from this trend as its recent financials disclosure has given its share prices a jolt of momentum heading into Q3 2017. Looking at IG Group’s recent filings of its full year results for the financial year ending on May 31st 2017, the broker’s revenues were higher by 7.6 percent when compared to the previous year. This marked a total of £491.1 million ($643 million). Profits before taxes are up 2.8 percent to £213.7 million ($279 million) and up 3 percent after taxes to £169.2 million ($222 million). Perhaps more importantly however was IG Group’s interesting review of the evolving regulatory landscape in Europe. The company’s revenue from UK and EU operations amounted to £330 million. Within this amount, £78 million came from equities trading, a product where new restrictions won’t apply. Corporate clients and non-resident clients may also continue using higher leverage. The company expects half of the firm’s total revenues to be unaffected by changes in UK and EU regulation, most of which has been deferred to 2018 following a decision by the Financial Conduct Authority (FCA) recently – for its part, IG Group endorsed the decision. Unlike many other retail brokers who have seen their share prices flounder in 2017, IG Group (LON:IGG) has had its shares rebound steadily since the beginning of the year. Year-to-date, shares have helped erase a Q4 2016 plunge, en route to a 2017 yearly high today of 651.5p. This constitutes a jump of 31.7 percent year-to-date from January 1, 2017. 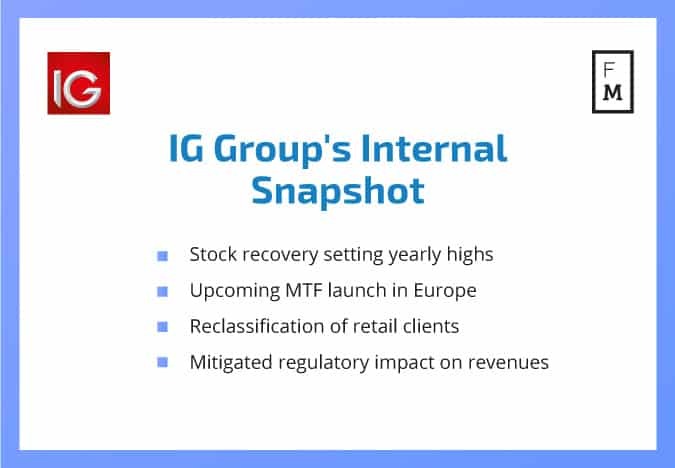 The group’s recent financials for the FY ending May 31, 2017 proved to be the biggest impetus in recent months for its IG Group’s share prices, which resulted in a surge of 16.0 percent at the time of its release. A couple of important revelations were brought to light in its disclosure last month, including a clarification surrounding regulations facing the group. One question that had been on the minds of many in the retail brokerage industry – will all their clients be subject to the restrictive leverage levels applied by ESMA and the FCA? However IG Group answered for its own client base – the firm stated that the reclassification of retail clients to professional would substantially reduce the impact of regulatory restrictions on revenues. As such, clients will need to pass two of the three tests defined under MiFID – trading experience, a sufficient amount of capital and relevant occupational experience. Meeting two out of the three requirements is sufficient grounds for the broker to reclassify the trader if the latter so chooses. In addition, IG Group has already initiated the process of developing a Multi-Lateral Trading Facility (MTF) for its European operations following shifting regulations. Its planned implementation comes as increased supervision from European regulatory authorities is pushing companies to look for different ways to diversify their offerings to retail clients. “This on-exchange offering could provide further protection for IG’s business across Europe and increase the opportunity for further growth in this region. There can be no certainty of success here,” citing a company report outlined in its earnings statement.